Recently I was introduced to i declare! charms and I am so excited to share them with you guys!! 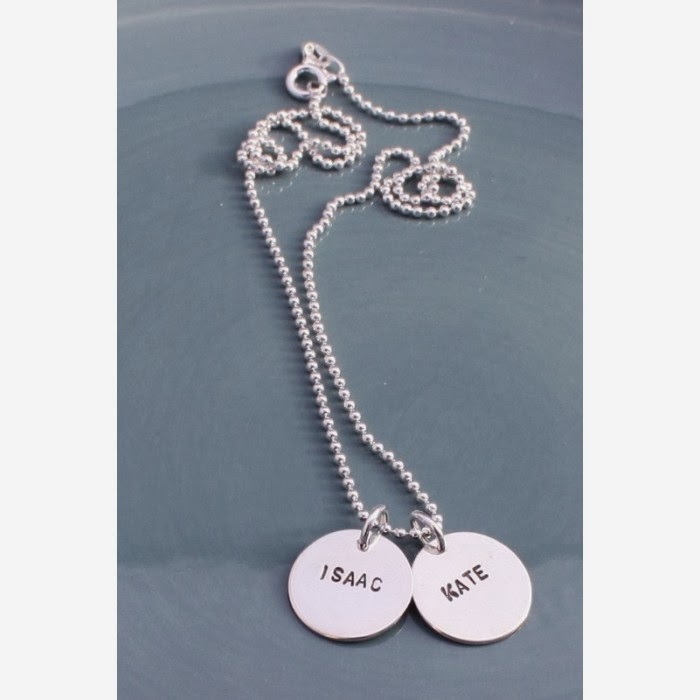 They make absolutely beautiful hand stamped necklaces and bracelets that you can personalize. It's the ultimate meaningful gift idea for the holidays or any time. Years ago my husband gave me a necklace for mothers day that had tiny little silver disks with my children's names on them. It was a complete surprise. I LOVE that necklace. I have worn it just about every day since he gave it to me. Next to my wedding ring, it's my most beloved piece of jewelry. Turns out, Brent ordered it from I Declare! When he saw my new necklace come in the mail he said, "Hey! That's where I got your other one from." Who knew?! So, not only can I tell you how gorgeous this jewelry is, I can tell you that it holds up well over time, too. Every time I wear my kids' name necklace I get compliments on it. It's so simple and pretty, but also makes a statement, which I love. I can even wear it with my more chunky statement necklaces and they look great together. Since I already have a necklace for my children, I decided to get one in honor of my husband. It says "forever" and has our wedding date underneath. It is stunning in it's simplicity! I will wear this alongside my other one every day from now on. The quality is second to none. Here's the part I am most excited about! I get to give one of i declare! 's Classic Name Necklaces to one of you!! I'm telling y'all -- you're going to love this. This giveaway ends next Wednesday, November 20th at 12:00 a.m. Winners will be chosen by Rafflecopter and will be notified by email. Good luck, friends! these are so cute! I have one similar but it's very sharp on the edges so I rarely wear it. I would luv to win! whoops forgot to tell u who.....I don't know! no seriously I wud probably just pick one and purchase (cor) and purchase the other immediately cuz I cant only have one! altho I might see if I could copy cat ur forever. I already have a charm with the kids and hubbys names so Im not sure yet what I would get. I don't have kids, so I'd probably just do mine. They're so pretty! The kiddos - maybe just initials and birthdates?? I think I would get something for me. I really like personalized stuff. Thanks for this giveaway! Do I have to pick just one?! Maybe I'll have to buy two more to include all three kids! I'd put my two kiddos names on it! I think I would also put my kids names on this beauty..and then probably buy one for my anniversary which is coming up next month. I think that I would like to put my kids names on the necklace. Love it! I have always loved your necklace! I do LOVE the one with your wedding date. I think I would have to get one with both boys' names and birth dates as well as my wedding date! So cool! I so want to win! I might put all of my boys' initials! I would put my grandbabies' names on it. Thanks a bunch! I would do kids names for grandma! My friend... she is "about" to get engaged. Love to give her this and her fiancee's name as a present.